I would caution anyone who did not see last night’s episode to stop reading at this point. So many SPOILERS. But, alas, it was not. Fellow bloggers Kevin Ahern and Brian Flanagan made some waves on that Monday with excellent snapshots of the impact of this announcement, one that will surely be talked about for years. 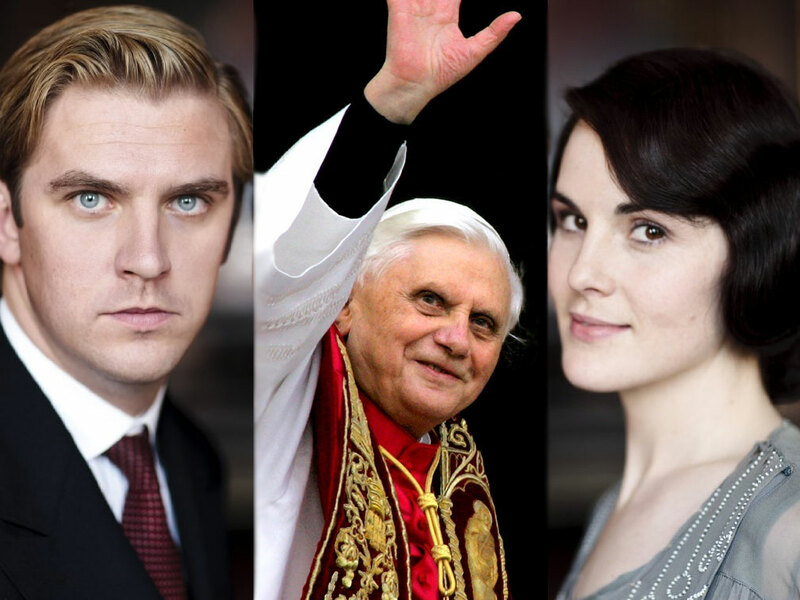 In this light, I simply couldn’t tear my mind away enough to write on Downton…especially since I could hardly fathom what just happened in the world of Catholicism. With all this glee of Matthew’s awesomeness, and someone clearly having to die as the season ended, Matthew’s demise is less surprising. Indeed, hadn’t Matthew mentioned the perils of driving in the 1920’s in a recently published interview and laid his cap on the tombstone of the last person who died driving home from the hospital? Oh, wait. By the way, I know I should respect the Holy Father’s sense of piety and his own calling, but is it not altogether clear that the Papal resignations from the Middle Ages happened because of corruption and political warfare? I was reminded recently that Dante mentions Pope Celestine V, the Pope on whose tomb Pope Benedict laid his pallium (read: scarf-type priestly garment) a few years ago. Dante was somewhat unhappy with Celestine’s decision, placing him just below the entrance gates to Hell, having seen his resignation as “cowardice” and “the great refusal” (Inferno, III, 59-60). I imagine Benedict does not share Dante’s view. But Benedict’s reverence for Celestine is deeper than a shout-out for the guy who made the resignation loophole. Benedict realizes well the political pressures of the office of the Papacy, and realizes his own inability to handle some very political issues like the corruption and infighting at the Vatican (culminating in the “Vatileaks” scandal). The resignation is his admittance that he cannot accomplish that which he desires to accomplish: his directions go unheeded and he lacks the energy to enforce the changes he wishes to make. In my view, this must be his reason for his resignation: it cannot simply be that he is tired and weak. Perhaps, like Michael Jordan, the once and future Cardinal Ratzinger just can’t let go of being an intellectual superstar: writing books on obscure theological arguments and warding off the vultures who attack the Second Vatican Council. Perhaps he really wants to change things like clerical celibacy and women deacons but doesn’t want to deal with the aftermath, or literally lacks the energy to make the change himself. In both cases he has demurred in the past many years, claiming that they were “under investigation” while talking of the benefits of the current order and letting some Anglican crossovers slowly increase the number of married Catholic priests. In a manner of speaking, he has stalled. But is there some deeper meaning here? Some larger reason for killing him off? Of course there is. The actor didn’t want to renew his contract. Oh, well, this is just trite then! You mean to say that they weren’t trying to recreate Romeo and Juliet? They weren’t trying to bring the beauty of the tragic opera back to the modern world, stripping the silver screen of its ridiculous happy endings once and for all? They were just reacting to a failed contract negotiation?! I feel like Matthew just died all over again. There is such remarkable power in the ancient art of tragedy. To watch the absolute horror of Euripides’ Medea or Shakespeare’s Hamlet allows us to see our own faults and failings first-hand. Indeed, tragedies could be called the first form of group psychoanalysis. The viewers are invited into the mind of one whose world could have been perfect but whose life ended in the darkest of places. The tragic forces us to recollect upon ourselves, realizing that, like in Romeo and Juliet, violence will always destroy the innocence of love or, as in Hamlet, that revenge always leaves behind the bodies of those we love. Even, more recently, in 100 Years of Solitude, that prosperity and wealth does nothing to stem to endless circle of love, life, destruction, and death. Tragedy reminds us, in the end, of the basic needs of life. And oh, Pope Benedict XVI, you have rescued us with your final revolutionary act. Matthew’s death was surprising but fleeting. Your resignation, Holy Father, brings us tragedy of a much deeper form: the political difficulties of a larger-than-life papacy and a Catholic Church in need of a strong leader forced your hand, as it did Celestine’s so many years ago. The tragedy today is not the human person of Shakespeare or Euripides, but the sad fact that the social and political order of the world has progressed so little in 700 years that a Pope feels compelled to resign in light of the demands of the present world. May it be a lesson to us all.